During the Mobile World Congress in Barcelona in February 2013, many people from all places of the world come to my city to learn about the latest trends and new solutions around mobility. Among these new solutions, I would like to highlight those related to new shopping experiences that are enabled by smartphones. Mobility has been adopted by consumers into the shopping process. They are using it to obtain real time information influencing them in their purchasing and decision making process. But also they are using mobile as shopping tool that can help them to make the shopping experience easier and smarter. Through this, one of the biggest influences of smartphones is now the power to drive-in store conversion and the average order size, rather than only direct sales through the mobile channel. Consumers have the opportunity to scan products in a shop by themselves, get product information, obtain social advice, receive personalized offers and even more important to put the product into their virtual basket in their mobile. And once there, it is where the mobile payment is starting to have its real opportunity to become a reality, being massively adopted beyond the different pilots done during last years. 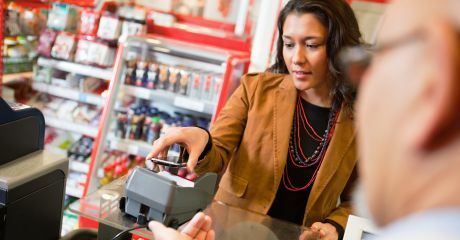 Stores are adopting mobile payments to speed up the payment process and reduce the queues but also as a complementary mechanism for online payments. Consumers have the opportunity to pay with their mobile at the point of sales using QR codes or NFC as a contactless method for payment, but they also have the opportunity to transform their device in a point of sales by paying in the cloud and getting a confirmation to leave the shop with the products bought or ordering a home delivery of them. Mobile commerce will reach 24.4% of overall ecommerce revenues by the end of 2017(Abi Research) facilitating in-store sales and becoming a clear booster for mobile payments technology. After many years mobile payments can finally become a universal payment mechanism, complementing and even substituting physical credit cards and cash payments, as the basis of a Zero Cash Society much more sustainable than using physical money or plastic cards. Santi Ristol is Director of the Mobile Competence Center at Worldline (the European leader in the payment and transactional services industry), member of Atos Scientific Community and member of WIN (Worldline Innovation Network). He is also visiting lecturer at the Toulouse Business School in Barcelona. He has been working in Atos since 1992, he started working in satellite communication projects, then he worked in eBusiness projects and later focused in R&D Activities in Atos Research and Innovation. Since 2010 he leads the Mobile Competence Center providing expertise for mobile solutions and digital enablers around mobile solutions (wearables, IoT devices, beacons, blockchain, digital signage, etc.) to Atos and Worldline clients worldwide. Santi is Telecom Engineer from the Universitat Politècnica de Catalunya and holds a Master in eCommerce by La Salle – Universitat Ramon Llull in Barcelona.